THE EUROPEAN INVESTMENT BANK (EIB) has agreed to provide a low-cost loan that will cover nearly half the overall cost of linking Dublin’s two Luas lines. The EIB has agreed to provide a loan of up to €163 million at an interest rate lower than would be available on normal lending markets to fund the Luas Cross City project. The money will contribute towards the €368 million cost of the project which is currently under construction and is expected to be completed in late 2017. Though no fixed interest rate has been set, Transport Minister Leo Varadkar said on RTÉ’s Morning Ireland morning that this would typically be about one per cent lower than usual interest rates. He said that linking the green and red Luas lines will take about three million car journeys off the road every year and the construction phase will generate up to 800 jobs. 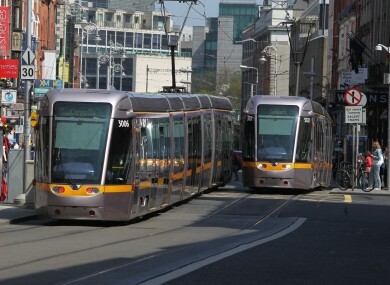 Sixty permanent jobs will be created by the Luas extension which will add 13 new stops to the existing infrastructure. Email “European Investment Bank agrees to partly fund Luas Cross City”. Feedback on “European Investment Bank agrees to partly fund Luas Cross City”.